Summer time when you’re younger meant sleep away camp, trips to the pool, and sleepovers with friends. As you get older, summers fill up with jobs, summer programs, and as you approach senior year, college tours and decisions. As you evaluate potential colleges, college tours become an important step in assessing your options. Even with the abundance of online resources like college websites, virtual tours, and discussion forums, there’s nothing like setting foot on campus to get feel for whether a college is a good fit for you. There are many articles and suggestions on the basic things you should do on college tours. Check out the facilities related to your interests, visit the library, scope out Greek life – sorority and fraternity row, etc. But college tours are also a great opportunity to interact with students and staff and get important insights on infrastructure and support around student life, academic opportunities, and career development. Here, we’ve put together a short list of important questions that students don’t typically think to ask but should. How are student clubs and organizations on campus managed, and what is the process to start a new club or organization? Classes will only a small part of your college experience. In your four years at college, you’ll likely (and hopefully) be spending a significant portion of your time involved in activities and organizations on campus. It’s important to understand the level of support and funding available for student groups and how these groups are managed. Who manages student groups and budgeting? What student groups have big presences on campus? How is budget determined or allocated? It is also helpful to get a sense of the ease and opportunity to carve out your own niche if your interests aren’t represented by existing student groups. What is the process to start a new club or organization? What are the requirements that must be met? How do you qualify for funding? Getting the answers to these questions during your college tours will give you a better sense of challenges you might be up against if you do become a student leader there. While it may not be a deal breaker, it’ll help you weigh the pros and cons for each school. What research/advanced classes opportunities are available for undergraduates? One of the “perks” of the college experience is having access to visionaries and leaders in various industries through classes, speaker series, guest lectures, etc., and top colleges take pride in their renown, accomplished faculty. For some prospective students, their decision for their top choice college(s) may even hinge on professors they admire in their chosen field/majors. However, it is important to ask questions upfront to ascertain what opportunities are available to undergraduate students. In some cases, the professor you’re excited about may only teach graduate level classes, or research opportunities with high profile faculties may not be open to undergraduate students. Of course, there may be opportunities outside of classes or research projects to still engage with and learn from your heroes, but it’s good to get the inside scope on your college tours to align expectations in advance for what you can expect. How does the class selection/registration process work? This is a big one. This is a question not many students think to ask because class selection seems pretty straightforward – you browse the extensive course catalogs with the wide variety of classes available as advertised by colleges, you sign up for classes you’re excited about, and you in! Unfortunately, this isn’t always the case. Colleges all have their own formats for how class selection and registration work, and popular classes may be tough to get into. Colleges may offer priority to graduate students for cross listed courses (the same class available to undergraduate and graduate students), for students in specific majors, the number credits you need, special honors programs, among other considerations. Similarly, some colleges may be courses that are restricted or require an application, interview, or departmental approval. Because of how these systems are structured, there could be some challenges with getting into sought-after classes, being able to explore highly-rated classes in fields other than your majors, and limitations to what classes you can fit into your schedule in order to graduate on time. Getting the scoop ahead of time will give you a better idea of you can expect from your academic experience at a college. What resources are available to help students find internships, summer opportunities, and full time jobs? This is another element that many students don’t think of until later in their college career but a crucial questions to ask and understand early on. Ultimately, one of your main goals in college is to set yourself up for success for a strong start to your career after college. What resources, infrastructure, programs does college have in place to help you achieve this? Some colleges have done an amazing job on this front – from building their school brand within various industries to forming relationships with top companies or institutes for recruitment and placement. These school have robust career counseling programs, job fair events and activities, and well-organized and established recruiting processes. These programs make a huge difference in the ease, stress-level, and success their students can expect when it comes time to look for a summer or full time work opportunities. This is especially crucial for colleges in more rural or suburban environments where there is less exposure and access to big companies, research/medical institutes, etc. for research, internship, externships experiences. 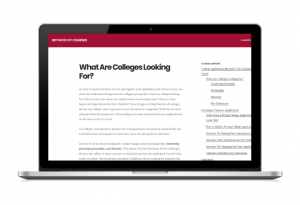 For other colleges, these options are still fairly new and not well established. As a result, as a student, you will have to be more proactive on your own and may have to overcome additional challenges to find the same opportunities. Again, while this may not necessarily be the deal breaker, it is something to be aware of and consider when evaluating your college options. For more information and guidance on the application process, check out our College Application Blueprint and our Comprehensive College Application Checklist.